Zen Studios has enjoyed plenty of success with its pinball titles, releasing various versions and DLC across PC, home consoles and smart devices. The Wii U and 3DS have been in on the action too, with the former receiving Zen Pinball 2 with a decent variety of DLC, in addition to Star Wars Pinball and some of its extra content. The Wii U is often last to the party with DLC, however, and that seems to be the case with the freshly announced set for the Star Wars iteration - The Force Awakens Pack. It includes two tables - The Force Awakens Table and Might of the First Order - and is heading to 'PlayStation 3, PlayStation 4, PlayStation Vita, Xbox One, Xbox 360, Mac, Windows 10, Steam, iOS, Android, and Amazon mobile devices during the week of January 12, 2016'. The Wii U is missing there - as is 3DS, but that's no surprise - so we followed up with the studio to see whether Nintendo's system is still being supported. Director of Communications Steven Hopper has stopped short of 100% promising the pack for the Wii U version, but has stated that the studio is still supporting the system. Regarding Wii U, we're definitely still supporting the system, but at this time we have not revealed plans for The Force Awakens Pack on Wii U. We'll be sure to alert the Wii U community as that changes. As mentioned above support with major tables has been decent on Wii U, albeit the content often comes a while after other platforms. You can see a trailer for the new pack below; are you keen to pick this up on Wii U? Seems about right. WiiU getting left behind as per the norm. "That's okay, they can keep that! " Can't work out if this is ment to be good news or not so good news. When this sort of thing happens it's an instant no-buy for me. Looks like Zen Studios went to the EA school of "support and commitment to Wii U by no releasing games for it." As much as I LOVE playing Zen on the Gamepad (best shoulder buttons on any controller for pinball)... I can't possibly blame Zen for not supporting WiiU at this point in its life cycle when you consider the paltry install base, cumbersome eshop (especially for add-on content), and they have already announced that the next console is on the way. I'm happy to have my existing tables on WiiU... but I have way more on my PS3... which will carry over to my eventual PS4. @holygeez03 11 million (about the same as Vita) is a decent install base. I would think that WiiU owners would be more the demographic than Ps4 or Xbone. No announced release for Wii U and 3DS, but Playstation 3, Xbox 360 and Vita are all getting it? What kind of joke is that? I've bought all of the Star Wars and Marvel tables on the Wii U but the wait for some of them was horrendous. Now I'll probably have to wait a year until they release The Force Awakens, heck the NX will probably be out before Zen get it ported. The thing is I don't want it on the PS3, PS4, 360 or XBO even though they are all options for me; I want it on the Wii U for the offscreen play. Zen say they did the cross platform support on PS as a reward to the people who bought the tables, but how about some reward for me considering that I've bought tables separately on the Wii U, 3DS and Android. I don't want freebies, I just want to be able to buy the tables on the Wii U. 3DS shouldn't even be a thought on anyone's mind anymore. It's a shame, but last I checked, they were still using the old engine (pre-Zen Pinball 2) for the physics. The 3D makes the game a blast to play, but at the same time, the frame rate is atrocious. Makes me sad they haven't supported the system in years. Android, on the other hand, is getting all of my support. Between portability and Chromecast screen mirroring, I'm happy. As soon as I saw this announced, I had to stop myself from getting excited as I instantly said "I bet it won't be on Wii U though". And here we are. At least not yet. I've be mostly solely first larty Nintendo for 20 some years. In recent times, I very much wish I had the cash for a second other system, more than I ever have. At least back in the N64 and GC days, we had Rogue Squadron. And Rare, but that's another story. @rockodoodle the issue isn't install base as much as it is the eshop. These pinball games are sold as dlc and their is no good way with their setup to know when they release something unless your actively playing. 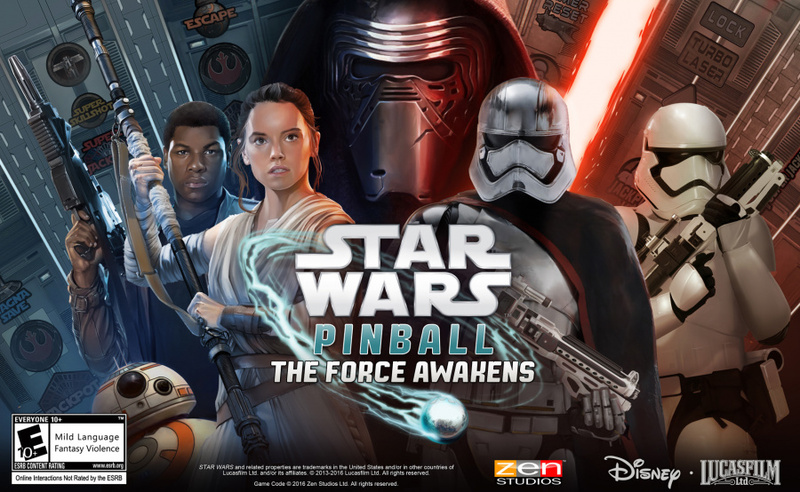 I bought everything and will continue to do so,... would be nice if star wars is integrated into zen pinball, now we need to restart zen pinball to play some star wars. SEE I TOLD EVERYONE WE'D GET A NEW STARWARS GAME. Pinball with no DLC > everything else new. @Bananaman678 I agree, they can be coming up with way better games. But not based on the movies those are all mostly a terrible way to advertise their movie. They can make a spin off like KOTOR and SWTOR! C'mon zen I would really love to play the Force Awakens table. Please release it.